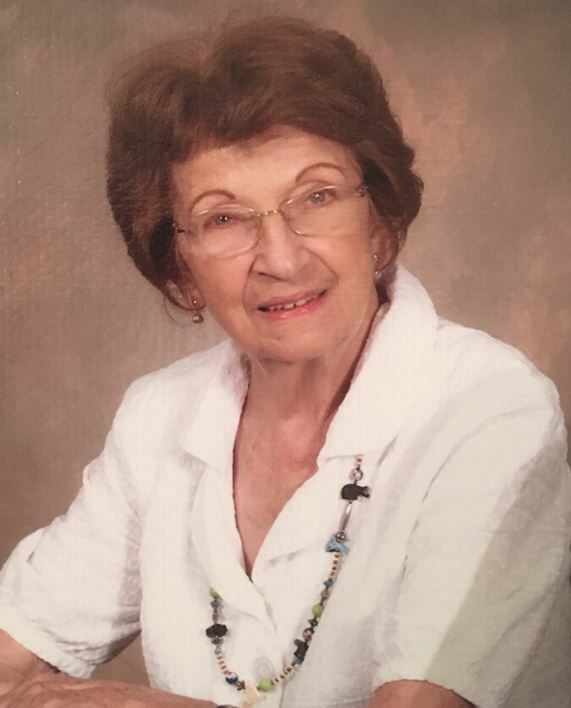 Carroll P Smalley, 91, died Saturday (December 1, 2018)) at her home surrounded by loving family. She was born December 21, 1926, in Newton to Ben and Ella Royston. She was united in marriage to Robert E. Smalley on August 3, 1947, at First United Methodist Church in Newton. They enjoyed 71 years of marriage. Carroll graduated from Newton High School with the Class of 1944. She was employed by the Santa Fe Railroad as a messenger until resigning to give more time to raising their family. After the children were grown she took classes and became a first-rate bookkeeper. Carroll and her husband owned and operated Smalley’s TV & Marine & Radio Shack. Carroll was very active in Girl Scouts and was also a Den Mother for Cub Scout Troop 111. She enjoyed outdoor sports as well and was an accomplished water skier and golfer. She was a devoted grandmother and participated in many of their activities. Carroll was an active member at First United Methodist Church serving in Circle, annual bazaar, and the peppernut brigade. Other interests included painting, crafting, shopping, traveling, and visiting with friends. She is survived by her husband, Robert E Smalley; children: Jeff Smalley of Newton; Mike Smalley (Kendra) of Edina Minnesota; David Smalley (Barbara) of Salona Beach, California; and Susan Scott (Leon) of Newton; and 15 grandchildren and 15 great grandchildren who will deeply miss her. She was preceded in death by her parents; 3 sisters, and one brother. A viewing for family and friends will be held 5 p.m. to 9 p.m. Tuesday evening with the family receiving friends from 6:30 p.m. to 8:00 p.m. at Petersen Funeral Home in Newton. Funeral Service will be 10:00 a.m., Wednesday December 5, 2018 at Petersen Funeral Home Chapel. Graveside service will be 1:00 p.m., Wednesday at Greenwood Cemetery in Newton. The family would like to give a huge thanks to Good Shepherd Hospice; they were wonderful, caring people to Carroll and Bob. Memorials are suggested to Good Shepherd Hospice, First United Methodist Church, and Carriage Factory Art Gallery of Newton in care of Petersen Funeral Home.